Harmful: the NASDAQ bubble in 1999/2000 caused $2 trillion of value destruction when it burst in late 2000 – 2002. It had a hand in slowing US growth and damaged a whole generation of investors’ confidence in equity markets. Nearly deadly: the 2007 US housing bubble set up the Financial Crisis and Great Recession, with global effects running to the tens of trillions of dollars. Curiosity: by contrast, this year’s bursting of the crypto currency bubble was much less meaningful both in terms of size ($620 billion lost from January 7th peak to now) and impact on the broader global economy (essentially zero). Curiosity: legal marijuana stocks – the latest group stuck with the “bubble” moniker, are even smaller than crypto currencies. The largest one by market cap – Canopy Growth – has a market cap of $15 billion. Tilray’s market cap is $13.5 billion. Aurora Cannabis’ market cap is $9.0 billion, and Cronos Group is $2.4 billion. If they all got cut in half tomorrow, it wouldn’t matter to anyone other than current holders. #1. A large current or sizable potential future market. Crypto currencies were supposed to replace government-sponsored money, a huge (multiple trillions of dollars) addressable market. Housing is the largest capital market in the US and until the Financial Crisis had never declined in value on a national basis since the Great Depression. #2. An idea that resonates deeply with a core audience. Anything that becomes a bubble starts with a core group that passionately believes in a core principle. Home ownership as part of the “American dream” is one example. The early promise of the Internet and the 1990s dot com bubble is another. So is the thought – still popular in many circles - that crypto currencies can eventually replace sovereign-issued money. #3. Compelling, if theoretical, economics. We recently hosted a panel on legal marijuana at the Dallas Securities Traders Association and were struck by how high returns on capital eventually might be in the space. Something like $1 billion of capital should, in theory, be able to generate $5 billion of sales at +20% pretax margins. Yes, a 100% ROI before tax… Who knows if the industry can manage that, but you can see why investors are excited by the opportunity. #4. Limited pure-play investment opportunities. 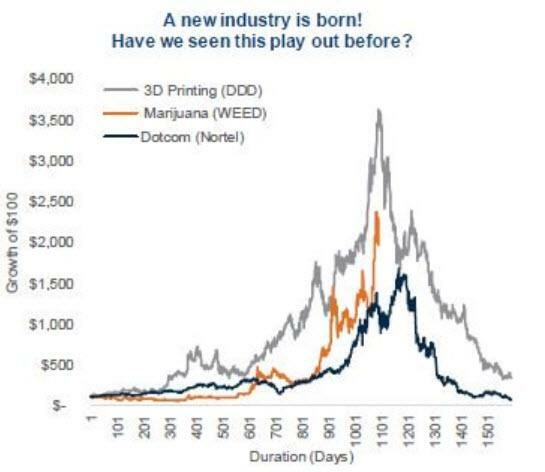 In a nutshell, this is why legal marijuana stocks are so hot right now. There are a handful of US listed names and a dozen or so listed on the OTC. It reminds us of when there were less than 100 crypto currencies in the wild and the only one most people knew was bitcoin. Large levels of interest and limited supply are hallmark signs of a potential bubble. #5. A conscious avoidance of basic math and basic due diligence. The word “mania” comes from the ancient Greek word for “madness” or “frenzy”. That neatly summarizes the peak of any bubble, when caution goes out the window in favor of price momentum. Last thoughts/summing up: as long as humans control capital there will be noticeable imbalances between rational price setting and herd-like behavior. We don’t view that as a flaw as much as an annoyance. Regulation is the only answer to avoiding bubbles that can cause systematic damage, and even that is not a foolproof answer. 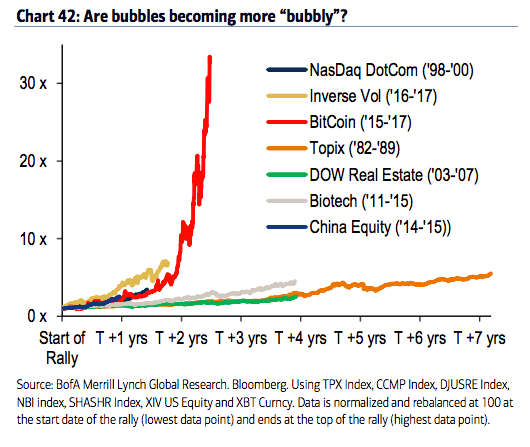 In the end financial bubbles, unlike their soapy namesakes, are a permanent feature of capital markets.